1000 Cooking Recipes from ELLE à table can be manipulated entirely using the Touch Screen and DS stylus. You can set the Touch Screen according to whether you are left- or right-handed and there is handwriting recognition, allowing you to scribble down notes with ease. Use the in-built Nintendo DS microphone to navigate your recipes while you have your hands full – saying “Continue” or “Go Back” will flip the pages for you. You know when you make a perfect-looking dish that it’s almost a shame to eat? Or you want to remind yourself how a prepared meal looks? There’s a solution for both these dilemmas if you have a Nintendo DSi or DSi XL. Just snap a picture of your finished meal using the outer camera and save it to your recipe book. Easy! 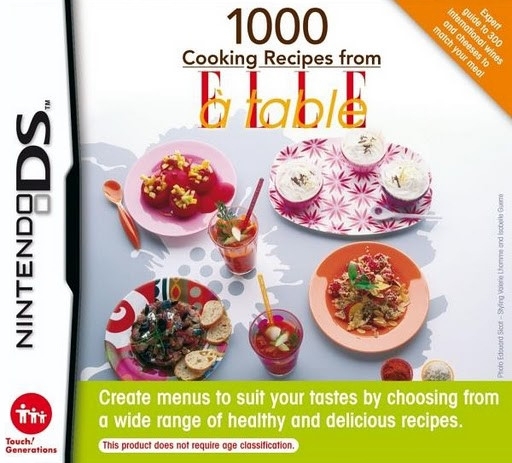 If you’d like to share recipes with your friends and family, Nintendo DS Wireless Communications is the answer! Simply go to “My Book” and select the “Presents” option. You can then choose to “Give a Present” or “Collect a Present”. In order to pass on a recipe, just select the recipe of your choice with the stylus and touch “OK”. Your Nintendo DS will then search out other Nintendo DS systems in the vicinity and your job is done!